Vegetable cream cheese and geology have a lot in common. That might sound strange, but hear me out. Clastic sedimentary rocks are made up of pieces (clasts) of rock that are cemented together by finer sediment called the matrix. Sound familiar yet? Vegetable cream cheese is basically a really delicious clastic sedimentary rock. There are the clasts (carrots, peppers, red onion) and the matrix (cream cheese) and it’s imperative that the correct clast to matrix ration is achieved for maximum flavor without loosing the integrity of the structure as a whole. So that might be a bit obsessive, but it’s a pretty good way to think while you’re making vegetable cream cheese. Some people like more matrix (cream cheese) and fewer clasts (veggies) and other (like me!) like to pack in as many veggies as possible. It really all comes down to personal preference. Whatever your preference, making vegetable cream cheese at home is way less expensive than buying it at your local bagel shop and way more delicious. 1/3 cup finely diced peppers (red, yellow, orange and/or green) Use whatever you have around! 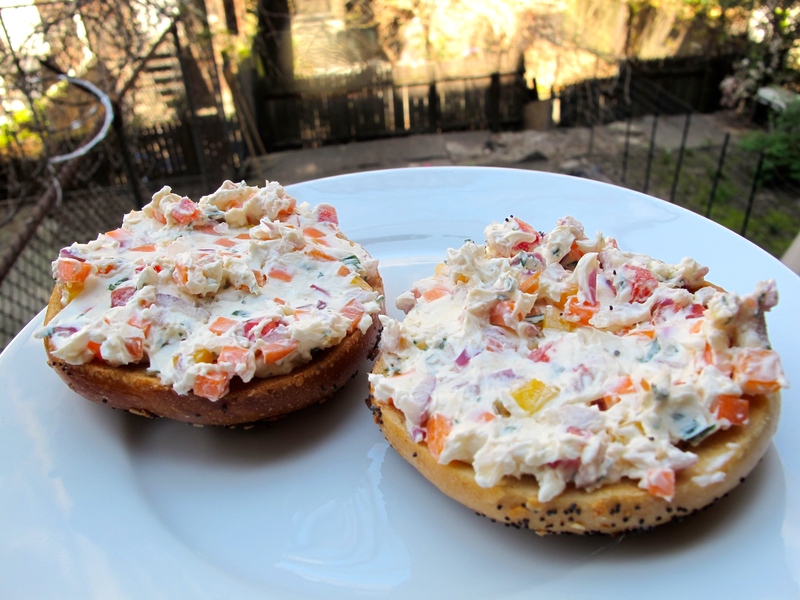 Spread some on your favorite bagel and save the rest for later. “A bagel with vegetable cream cheese is basically a salad with really big crouton.” – Me to my roommate.